So, today I’m partnering with PG&E to share some quick tips on how I make my home more efficient and take some of the sting out of those huge winter energy bills. I have read a LOT of lists for ways to make my home more efficient, but today I'm going to share with you what I have PERSONALLY done to save money during the winter. I don't want to recommend something I'm not willing to do myself. Saving on lighting costs is more relevant in the winter when we have less daylight for longer periods of time. I’ve shared this tip before, but it is still my favorite: You can replace your standard incandescent bulbs with fluorescent, or even better, LED bulbs. The cost savings is more than you would expect. 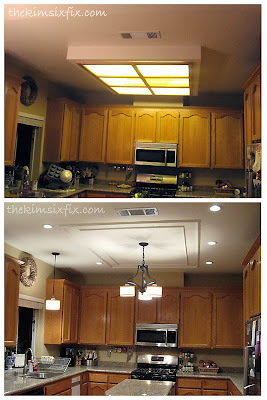 I replaced my fluorescent box fixture in my kitchen with LED can lights and I LOVE them. 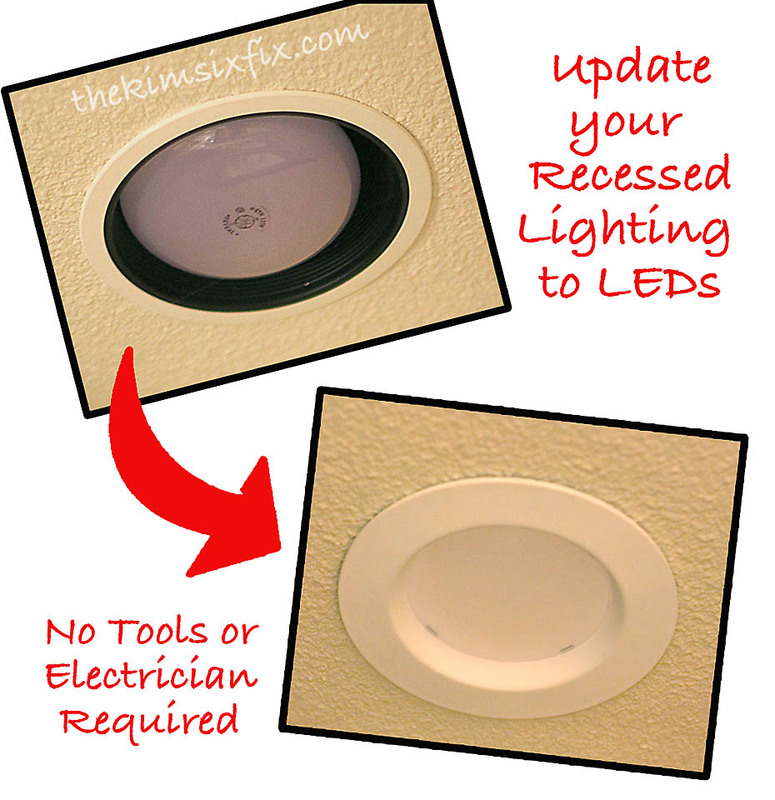 Another tip (and yes, this may be obvious), is that you should be sure you are turning off lights when the aren’t in use. Smart bulbs, like I’ve talked about before, make this easier, but just being aware when you are leaving the house and looking around quickly to see if you forgot any lights is just as effective. No matter what type of furnace or boiler you are using (we have a gas furnace) there are few simple fixes that can really cut down on your energy consumption. Set your thermostat to 68 (or lower) when you are home. You use 3-5% MORE energy for each degree above that. When you leave the house, set your thermostat to 56 (or lower). Rolling back your thermostat 10 degrees for hours can save you as much as 15% off your heating bill. If you aren’t using rooms in your house (unoccupied guest rooms for example) you can shut off the heating vents (we use these magnetic vent covers) and closet the doors. No point heating space you aren’t using! We don't heat empty rooms upstairs. Obviously, there are bigger projects that will save you lot of energy loss (Energy star replacement windows, proper insulation of attics and basements/crawl spaces, making sure door seals are good, having your furnace cleaned/inspected annually.) We have done most of these. I was stunned by how much easier it was to moderate the temperature in the bedrooms where our old aluminum single pane windows were replaced with insulated vinyl replacement windows. We will earn back the cost of the windows in only a few years. Appliances and electronics are some of the biggest energy users that most people tend to ignore. They seem less obvious than the lights and the heating so people tend to not pay attention to them, but there do actually use a lot of energy. We recently replaced all our kitchen appliances with Energy Star rated versions, and we have seen a difference in our energy bills (especially considering an appliance like a refrigerator runs ALL THE TIME. Even a 5% reduction in energy use by that single appliance really adds up.) Plus our old fridge was eligible for recycling by the PG&E program which included a $50 rebate! If you are considering upgrading any appliances, make sure you take into account energy efficiency. PG&E offers a rebate catalog which can help make it easier to find a bargain when looking for a energy-effecient appliance. Electronics (phones, tablets, computers, TVs etc) can be "vampire" energy users by sucking up electricity even when they don't need it. Remember, leaving fully-charged electronics plugged into the wall still uses electricity. Once they are charged you want to shut off the electricity going to them. 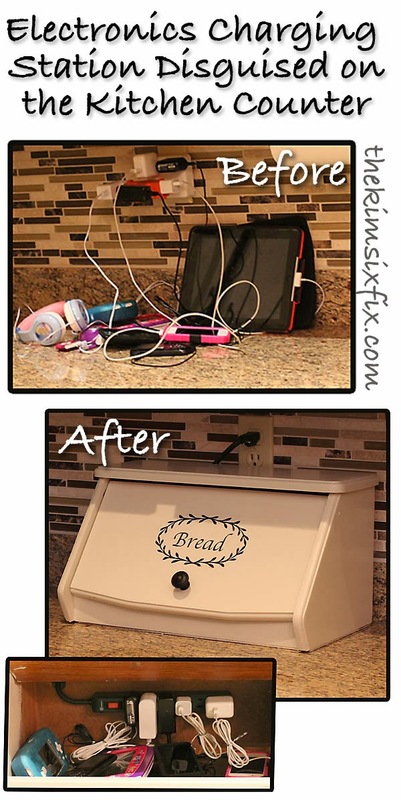 By charging all my electronics on a power strip (in my case I disguised it inside a bread box to ‘pretty it up’) I am able to shut off then all off at once instead of having to unplug them all individually. We always try to use cold water when running the garbage disposal, washing laundry, brushing your teeth or rinsing dishes that aren’t heavily soiled. It takes a lot of energy (either electric or gas depending on your water heater) to heat water, and if you run a lot of water through the faucet waiting of for it to heat up, you are also wasting a lot of water. If it isn’t necessary to use hot water you save energy and water by using cold. I always run my dishwasher and washing machine only with full loads. This is also due to necessity, it is faster and more efficient to run less loads, but if you don't have a huge dish/laundry producing family like I do, just let the dirty ones sit a little longer. Running two small loads two days apart uses quite a bit more energy and water than running just one load. Also remember to use the shortest cycle that will still allow dishes/clothes to get clean. If your water heater isn’t insulated, you can use a water heater blanket to help prevent heat loss. Our current water heater is well insulated, but our previous one was not. A $30 blanket was a great easy upgrade. 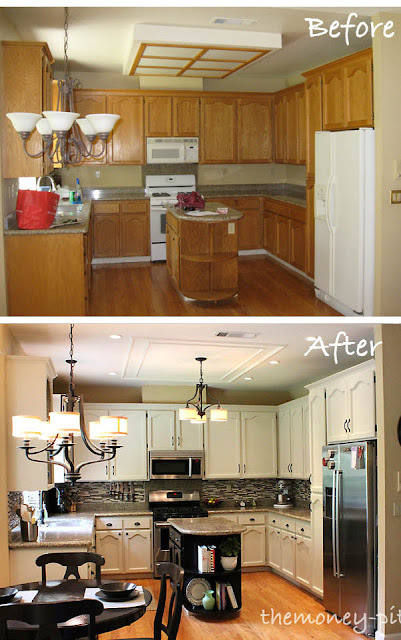 I have only touched on the tip of the iceberg when it comes to making your home more efficient. PG&E have a truly fantastic list of easy (no cost, low cost, and investment) ideas to help reduce your usage even further. They also break it down for you room by room with their money saving tool (which also links you to each area’s specific rebate programs). Finally, if you need even more ideas on how to conserve in your home, the “my energy tips” section of their website is a collection of tips from real homeowners. What Energy Efficiency changes have you made to your home? Have you noticed a difference on your utility bills?